Alke' electric delivery vehicles are silent, extremely easy to move around and with a big load volume suitable for logistics and last mile delivery companies. Why choose an Alke' electric vehicle for logistics? Logistics and electric mobility are increasingly more related. Alke' electric zero emission vehicles for logistics are suitable for different types of freight transportation, from business logistics to last mile delivery, thanks to their high maneuverability and small footprint. Moreover, they permit a pollution-free circulation in the city center and also in indoor spaces. Added to this, is important to mention the absence of noise pollution and a tangible reduction on maintenance costs, comparing with traditional combustion engines. 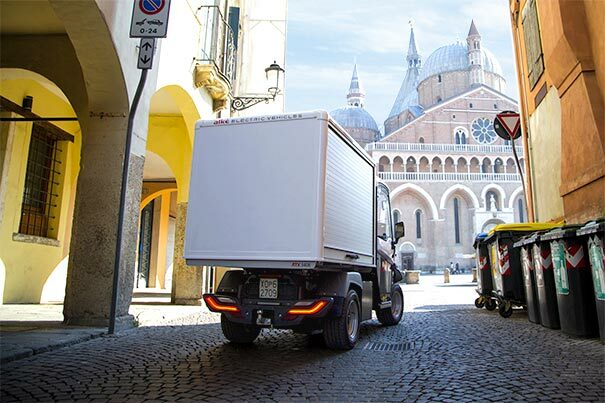 There are a lot of Alke' configurations suitable for logistics usage: with a load capacity up to 1.630 kg and a towing capacity up to 4.500 kg (2.000 kg if type-approved), these vehicles fully satisfy the needs of who manages goods delivery. Thanks to its compact dimensions, this nimble mini-van can easily move in small warehouses and in cities’ small roads. The maximum range is 150 km with vehicles equipped with lithium batteries, that is the most required configuration, also thanks to the short recharging times needed. Alke' electric commercial vehicles for logistics are extremely flexible thanks to the wide range of possible configurations. The more common configurations for the business and urban logistic are: box van body with sliding doors or with roller shutters, tarpaulin body, Isothermal box, refrigerated electric vans, closed van with hydraulic tail lift, automatic hook and coupling system for semi-trailers towing. In particular, in the case of vehicle fleets, Alkè can provide custom configuration and colors. In addition, Alk' electric vehicles can be equipped with a Vehicle Body Computer for fleet management and remote control purposes, this technology is used to anticipate potential anomalies and promptly find a remedy. Write a short message to ask for prices and additional information for Alke' logistic vehicles.